This book overturns the special theory of relativity by making two simple changes in experimental design and asking a question which has never been asked before. The special theory responds to these changes by disproving itself. The first postulate of relativity refutes its own premise of equal merit and the second postulate refutes the first postulate. The changes in experimental design are simple and straight-forward. First, the customary omnidirectional light source is replaced by an optical laser. This imposes some discipline on recognizing the direction in which the observed light actually travels. Second, the experiments are conducted in a physical reference frame which then moves from one inertial reference frame to another. The theory’s own postulates are studiously applied to determine the results of each experiment. This provides information which allows one to address a new question: Does the special theory treat the change in a source’s velocity, when it is moved from one inertial reference frame to another, consistently with how it treats an equal difference in velocity between identical sources located in the same two reference frames? The theory’s own answer to that question is: no. How can that be?! It happens because perception is not reality. The relativity principle is based on a clever parlor trick played on us by the human condition. Based on his observations, Galileo’s relativity principle defines an object’s momentum as being equal to its mass m multiplied by the difference in velocity between the object and the frame of reference from which it is observed (P = m vo). If both the observer and experiment are in the same physical reference frame (P = 0), the relativity principle will define their momentum as being zero regardless of the magnitude of their change in velocity to move to a different reference frame. However, according to the laws of mechanics, the experimental result will be different in every inertial reference frame (P = m v means that /_\P = m /_\ v). Thus, for every different value of /_\v there will be a different value for the momentum in the new reference frame. It is only the observations which remain the same. 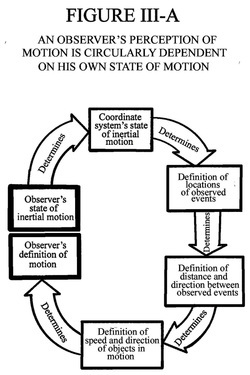 The new design reveals that an observer’s ability to perceive motion and even his very definition of motion are completely subjective and are unique to his own state of motion. An observer who moves with the experiment from one reference frame to another cannot detect the change in momentum simply because the change in his own inertial velocity matches the change in the experiment’s velocity. Only the observer who remains behind in the original reference frame will observe the changes in the experimental result as mandated by the laws of mechanics. That is because his motion hasn’t changed and, correspondingly, his perception and definition of motion haven’t changed. In short, the relativity principle, which is based on Galileo’s observations, describes only what will be observed. The laws of mechanics state what actually will happen. Contrary to popular opinion, the two are not the same. The relativity principle and the laws of mechanics are in direct, irreconcilable conflict. 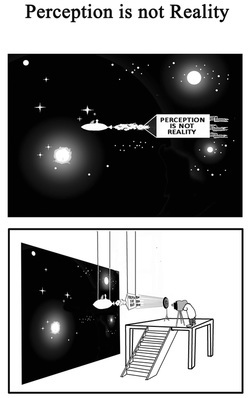 Perception is not reality. This is but a part of what the reader will find in these pages. Buy The Problem With Relativity now at Amazon, Barnes & Noble, or your local bookstore. It is distributed wholesale by Ingram. The experiments presented in Sections II through IV of this book are based on total acceptance of the postulates and premises of the special theory of relativity. For reference, the book begins with an overview of the circumstances, level of scientific knowledge and thought process involved in the development of the special theory as presented in standard physics textbooks and publications by recognized physicists. Based on that information, it then lists and describes the specific postulates and premises which underlie the theory’s predictions. These same postulates and premises then are used to predict the outcomes of thought experiments similar to those used by Dr. Einstein. The only difference between the experiments presented here and those shown in generally accepted textbooks are two changes in experimental design. One change takes advantage of an experimental technology which didn’t exist in the early 1900s to reduce ambiguity regarding the direction in which the light being observed is propagating. The other change takes advantage of the difference between a physical reference frame and an inertial reference frame to provide information which cannot be obtained from observations made in inertial reference frames. Throughout, the analysis is conducted with strict adherence to what the postulates of relativity and the laws of mechanics declare must happen in the stated circumstances. The chips are allowed to fall wherever the special theory’s own postulates say they must. The technology which Dr. Einstein needed but lacked is the optical laser. The knowledge which its absence withheld from him is that the propagation of light is a constant vector phenomenon, not merely a constant scalar value. Both the direction and speed of any tiny unit of light, such as a photon or a quick burst of light from a laser, are fixed and unvarying from its point of emission. The special theory only requires it to have a constant speed. The fact that observers in different inertial reference frames will perceive the same unit of light to travel for different distances on different trajectories is considered to be immaterial. However, when interpreting the observed motion of a unit of light, the difference in the number of degrees of freedom between a vector phenomenon and a scalar phenomenon is not immaterial. This is addressed by substituting a tightly focused laser for the customary directionally-undefined light source to enforce recognition of the trajectory on which the light being observed is propagating. To understand why using the laws of mechanics in analyzing changes in motion is entirely consistent with the first postulate; one must understand some key points. The Galileo/Newton relativity principle is based on observations of physical objects in motion operating under the laws of mechanics. Einstein’s first postulate of relativity, by extending the relativity principle to the propagation of light, is a statement that light also will operate in accordance with the laws of mechanics. That is why the special theory treats light as being subject to momentum. The laws of mechanics address both the effects of inertial motion (i.e., the law of inertia) and of non-inertial motion (i.e., the law of momentum which means that ). Because light is subject to the laws of mechanics, it is subject both to the laws of mechanics dealing with inertial motion and those dealing with non-inertial motion. The experimental design used by the special theory addresses only observations made in inertial reference frames. Thus, it does not and cannot address the effects of non-inertial motion. It does not recognize that the only way an experiment can be moved from one inertial state to another is to change its velocity. A change in inertial motion occurs only in a non-inertial reference frame. Thus, using the first postulate to determine the effect on light of non-inertial motion requires using the law of momentum in its non-inertial form Even though that particular expression of the law of momentum isn’t addressed by observations made in inertial reference frames, Einstein’s first postulate none the less extends it to the propagation of light. Section I provides an overview of the conditions under which the special theory was created, of the postulates and premises upon which it is founded and of Einstein’s rationale underlying its creation. Section II describes a thought experiment used routinely in physics textbooks. It explains and validates the special theory’s prediction that time will slow down when an inertial reference frame’s velocity increases relative to an observer in another inertial reference frame. This is called time dilation. This textbook example is used as a base for comparison with the conduct of experiments in subsequent sections. The multidirectional light source used in the textbook examples (and which was the only type available in the early 1900s) is replaced with an optical laser. That removes the ambiguity which has misled us regarding the vector direction of the light burst being observed. The same experiment is conducted in a physical reference frame (i.e., a spaceship) both before and after it changes its own velocity to move from one inertial reference frame to another. Einstein’s postulates of relativity are used to determine how the change in the laser’s inertial velocity will alter the trajectory of the light it emits. The change required by the postulates then is compared with what the observers in the two inertial reference frames will observe. What this approach discloses is that if the spaceship observer’s observation when in the first reference frame is correct and the two postulates are correct, then the observation made when in the second reference frame cannot be correct. First, this shows that observations made in the different inertial frames cannot have equal merit. Second, it discloses that the direction and speed at which a burst of light must propagate in the second reference frame is identical to what is observed by the observer who remains behind in the first reference frame. Thus, time must pass at the same rate in both inertial reference frames despite their difference in velocity relative to each other. If the two postulates of relativity are correct, the premise of equal merit cannot be valid and time dilation does not occur. 4. With time dilation excluded as a counterargument, Section IV uses a simple vector analysis to show why the propagation of light, by virtue of being subject to the second postulate, cannot be subject to the first postulate. 5. Given that Sections III and IV show that the special theory’s postulates and premises contain irreconcilable conflicts, Section V describes the role played by the human condition both in creating the flaws and in protecting them from discovery. 6. Section VI describes the universe according to Maxwell. 7. Section VII states the conclusions which result from the information presented in this book. 8. Appendix A adds some new thoughts for interpreting Maxwell’s equations to unearth how the behavior of electric and magnetic fields as the mediums of propagation for light compare with air’s behavior as the medium of propagation for sound. 9. Appendix B describes an experiment which will prove empirically whether or not light responds to momentum, as is required by Einstein’s first postulate. The experiment can be done inexpensively with available technology. 10. Appendix C shows why experiments involving the propagation of light must account for its directionality regardless of the perceived physical configuration of the light being observed.